Spring has sprung and so have our appetites. 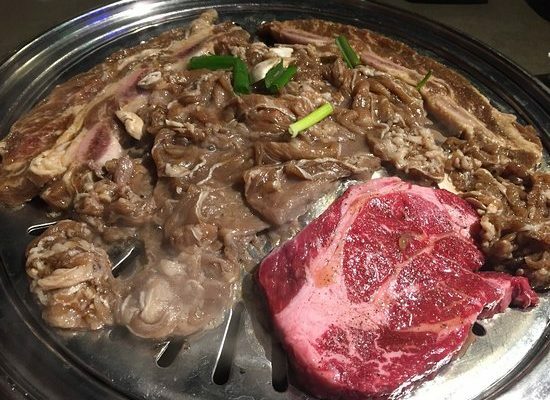 Recently, we headed to Wang Cho Korean BBQ (3911 Grand Ave., Chino, CA), an all-you-can-eat Korean BBQ restaurant with a young and hip vibe. There are several large-screen televisions, which makes it the perfect place to eat, drink some beers, and catch a game. Korean BBQ is a fun and interactive experience, which allows you to cook a variety of meats on a table grill. At Wang Cho, you first select your meat menu — Prince, King, or Emperor — and then order anything to your heart’s desire from that menu for the next two hours. We tried the Wang Cho King, which features many of our favorite beef dishes such as marinated beef short rib and beef tongue. We also love the steamed egg and garlic butter shrimp. It’s safe to say that two hours and eleven plates later, our bellies were happy and we were ready for a nap. BVO Tip: Ask for a side of garlic butter and use it to cook un-marinated meat, such as the Wangcho Steak, for extra flavor.